Oh, physician hello there readers! I have been swept away by an adorable baby and I’m determined to spend every last second of my maternity leave cuddling and playing with my little girl. So that means cooking has become less of a priority and I’ve neglected my poor blog. But a girl’s gotta eat and food should always be delicious. For me, this now means having something ready to go in the fridge. 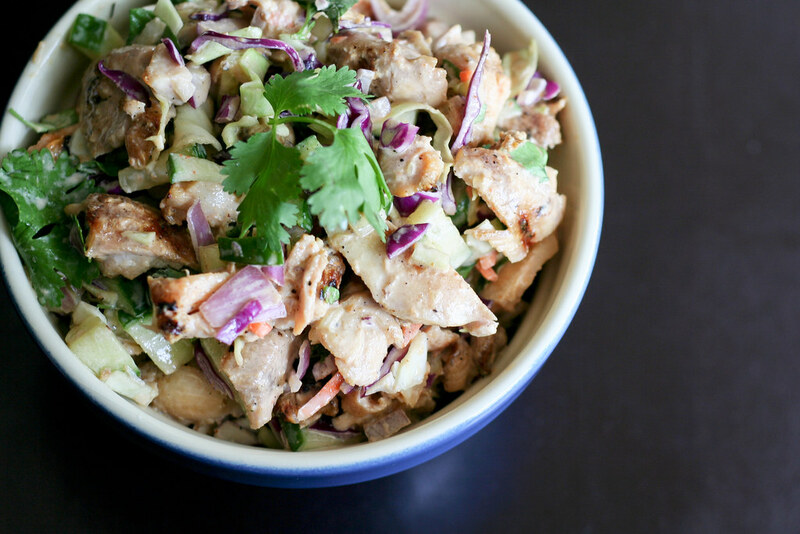 Like this Thai-style chicken salad. Good Lord, this stuff is good! First, you marinate the chicken in a little lemongrass, then throw onto your grill (or grill pan if you live in a condo like we do). Let cool, then mix with shallots, cucumbers, shredded cabbage, mayo, fish sauce, sriracha (rooster sauce) and cilantro. It’s got a subtle char flavor from the grill, crunch from the veggies and that spicy mayo combination that just makes it perfect for a warm and crusty roll. Butterfly your chicken breasts and set aside. Remove the tough outer layers of the lemongrass and finely slice the inner stalk. Place in a bowl with chicken, vegetable oil, salt and pepper. Cover and refrigerate for about 30 minutes (or all day if you prefer). Grill your chicken for about 5 minutes on each side over medium-high heat. Once it’s cooked through and has nice grill lines, remove to a plate and let cool. When the chicken is cool, dice into small pieces and place in a large bowl. Add the remaining ingredients and stir until well-combined. This looks so good. Crazy good! Congratulations!! I can’t blame you for wanting to spend as much time with your new baby as possible. This chicken salad sounds delicious and I’m not even a big chicken salad fan. Congratulations on your the birth of your little girl! This salad looks so darn good – full of all the flavors I love the most. HI! I haven’t visited your blog in a while and what a surprise to see you now have a baby! Wow, congratulations. The salad looks awesome, by the way. I cannot believe that I missed that you had a baby ! One of my favorite foods is Thai and this salad looks amazing! This is the first Pinterest that is so good! Lemongrass and Fish Sauce was a bit difficult to find but I did it! So good; it’ll be my lunch for the week! … That first-round pick is something that’s very important to us, just the impact you can get from it. What a better way for the young ones to Wholesale Jerseys Free Shipping get to learn a new culture, and may be pick up a word or two of the local language whilst having fun! Of course, once you manage to drag yourself out of your Bali holiday villa, the options for the young ones are even more numerous. ????????? ???????! ?????????? ??? ?????? ????? ? ????????? ?????? “???? ????? ?” ?? ????????? “?????? ?? ??????? ?????????”. 1) ??????????? ???????? ?, ???????? ?, ?????????? ?, ???????? ?, ???????? ?, ????????????? ???? ?, ??????????? ? ?????? ??????? ???????. 2) ?????????? ????? ??????????????! ?????? ????? ?????? ?, ?????? ?????????? ?? ??????????? ???????? ?????? ?, ????????? ????? ?, ?????? ??? ?, ????? ? ??????? ???????! 3) ????? ???? ?? ?????? ??? ?????? ??????? ?, ???????????? ????????? ? ??????! ?????? ???????? ??????????! ?????????? ?? ????? ?? ??????? ??????? ??????? ? ??????????? for President’s Day. The good news is I didnrrrt permit this to established myself again yet it triggered everyone to help get out and find new approaches to assemble my small business which brought me for you to internet marketing. Caudalie’s gentle skin cleanser ingredients include a privileged blend of botanicals. Calgary-based Canadian Natural Resources rose 4. That have to be challenging, but what do you do, or how do you get rid of a pimples fast?